The Thursday night sessions with the Young Writers have taken a new hue. Preparing to publish our annual book, we have moved from free-write to tight-write and it’s been a bumpy transition. Rework and revise don't invite joy. Work sounds like, well, work. And so we resist. We don’t want to work. We want to sing with words, to feel and release and breathe with relief. We don’t want to wrangle and second-guess. To the teens, I say: Editing is part of the art and process of good writing. You don’t wake up one morning and suddenly run a race. You practice and train. You slog through the rain and cold and move your body against sleep and sleet until your breath is easy, your legs long and lean. They hear: Writing is work. Learn to love revision. Listen to suggestions about what you might add, cut, reposition, and clarify in your work-in-process. Welcome such feedback with gratitude and humility, returning to your words with sharper insight. Make mistakes, lots of them, revising draft after draft of your continuing story. 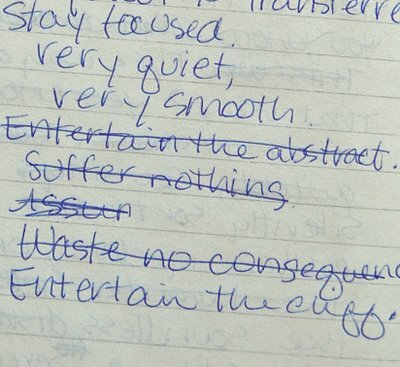 If you don’t think your work needs revision, here’s a tip: Don’t try to be a poet. You will never — I mean never — be any good. For a bit, we are buoyed by encouraging words. Our initial disdain turns to inadequacy: Where to start? What to delete? What to keep? We need direction, guides, rules. There’s no lack of writing guides, but where are the can-do books on the art of revision? I’m not talking Strunk and White’s Elements of Style. Grammar guides are abundant. I’m looking for an encouraging, practical, you-can-do-it guide to take us from raw goods to polished gems. It's a slippery thing, writing, editing, art. It's not paint-by-numbers, I know. The joy of creation is in finding your way. But surely there are rules we can follow and then, with knowledge, break. What's your process? How do you begin, and end? For you, is it all instinct and choice, or are there defined rules and routes?